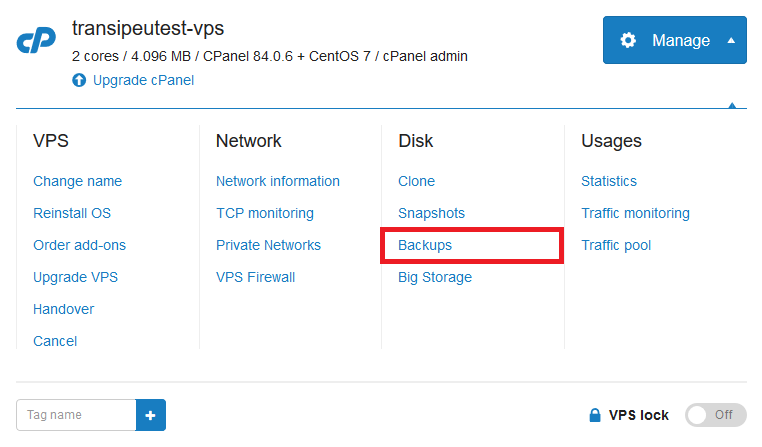 Log in to your control panel, go to 'BladeVPS' and click the name of the desired VPS for which you want these backups. Click 'Manage' at the top right and then 'Backups'. Click 'Order' under 'Weekly backups'. The weekly backups have a monthly price of 20% of the regular price of your VPS (not the promotional price from the first month). For a BladeVPS X1, you pay €2 ex VAT (€2,42 inc VAT) per month, for an X4 €4 ex VAT (€4,84 inc VAT) per month, etc. You get a total of 5 backups at your disposal with a total retention of 5 weeks. These backups are not stored on the VPS storage server, nor on an offsite location. The backups are stored on a similar backup server as the regular automatic backups. You can cancel the weekly backups just like almost any other Add-On for your VPS. Click here for more information about canceling an Add-On for your VPS. Please note: Weekly backups are, just like regular backups, complete copies of the content of your VPS at that time. You can therefore only restore the complete backup. This is NOT a backup of individual files (where you can choose which file or folder you want to put back), for this, you will always have to create your own backups. Also, note that new files that have been uploaded or modified after the time of the backup will also be overwritten when you restore them! In addition, it is also important to realize that the VPS is switched off during the backup. When this process is complete (a progress bar will be shown) your VPS will start automatically, and you can fully use your VPS again.